Kilim rugs are sometimes called flat-weaves. This is because they have no pile like a knotted rug. The technique used by the weaver is known as weft wrapping. To make a kilim, the weaver needs a loom like a conventional carpet loom. The warp threads are set on the loom and this becomes the foundation of the kilim. The weaver will weave coloured yarns, usually wool, in and out of the warps to produce a design. The method is quite crude. Designs tend to be very simple and geometric in style. This means that kilims are much quicker to make than a pile rug. This brightly coloured kilim is woven in Konya, Turkey. Woven in wool it makes a durable decoration for the floor or wall. This is a slit-weave kilim. Kilim rugs are woven throughout the rug making world. Turkey, Iran (Persian) and Afghanistan produce kilims with an historic tribal heritage. Each year the volume of true tribal weaving diminishes and now some types have become collectors items. This is a traditional slit-weave kilim. It's very old and has been repaired many times. It's woven entirely in wool, even the warp threads. India and China also produce many kilim rugs. They tend to be commercial copies of Turkish and Persian kilims. India can make these kilims very cheaply and often they use cotton rather than wool to reduce cost further. These are frequently sold through department stores and large furnishing chain stores. There are basically two different types of kilim though there are many variations in technique. A slit-weave kilim and a Soumak weave kilim. Slit-weave kilims can be identified by looking for the slits in the fabric of the rug where there are two colours side by side. 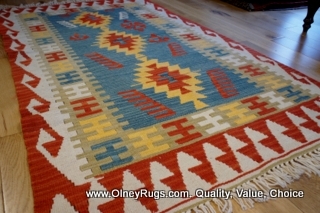 If the weaver takes some care to tie off the loose ends at each colour change a slit-weave kilim can be double sided. Soumak kilims can be identified by looking on the back of the rug. You will see lots of loose ends of yarn hanging down so a Soumac can only be used face up. Kilims have many uses. As a floor rug they are very practical. Easy and light to roll up for cleaning. People like to use them in kitchens and conservatories. 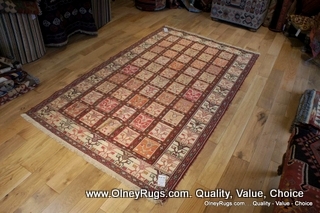 Kilims make great decorative table covers Ideal to protect a beautiful piece of furniture or disguise an ugly one. Because kilim rugs are light weight they make good wall hangings. Carefully placed lighting will show up the woven texture in the kilim.